Following the previous collaboration between these two, one might expect this to be a CD filled with pretty heavy noise. Not so, however. Instead, this is more like Cluster and Harmonia passed through a modern filter with, sure, a few dollops of noise here and there. But for most part the pairing here produce spaced-out sounds with twists of audio surrealism. Tabata is likely familiar to most readers of this blog, from his earliest work with Noizunzuri and the Boredoms through Leningrad Blues Machine and Amazon Saliva to high-profile albums and touring with Zeni Geva and, more recently, Acid Mothers Temple. Guilty Connector is one of the newer breed of heavy noise artists, with a good collection of intense recordings on his discography. On this collaboration, the album moves from opener “Shamrashamra” with its krautrock-ish guitar rhythm and zoomish synths through the dark ambience of “Trance Oscillation From Limbo” and the videogame synth bloops of “Bayti”. Then it’s on to blippy electronic percolations and buzzes over Tangerine Dreamish floating synth on “Soleca Nokto”, roiling synthesizers like burbling water on “Maquina de Fantasma”, the pretty textured ambience of “Patris”, and the concluding “Acta Est Fabula, Plaudite!” with slow rhythmic pulses and buzzing synth. This pairing’s produced an unexpected angle, and a very welcome one for any folks looking for some great old-style electronic music, updated in fine style. Good work. Visit the label’s web site for more information here. 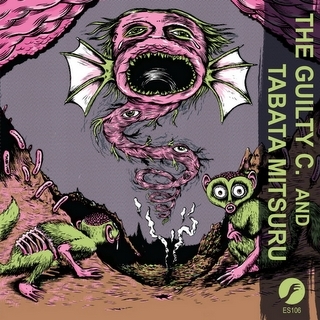 Listen to “Soleca Nokto” by The Guilty C. and Tabata Mitsuru. ~ by masonoise on April 9, 2009.